A photo of Nijinsky found, among other sites, here. Vaslav Nijinsky was a legendary dancer and choreographer, a Russian, and a man who loved both men and women. He was bi. "In him is reincarnated the mysterious child Septentrion, who died dancing on the shore at Antibes. Young, erect, supple, he walks only on the ball of the foot, taking rapid, firm little steps, compact as a clenched fist, his neck long and massive as a Donatello, his slender torso contrasting with his overdeveloped thighs, he is like some young Florentine, vigorous beyond anything human, and feline to a disquieting degree. He upsets all the laws of equilibrium, and seems constantly to be a figure painted on the ceiling; he reclines nonchalantly in midair, defies heaven in a thousand different ways, and his dancing is like some lovely poem written all in capitals." 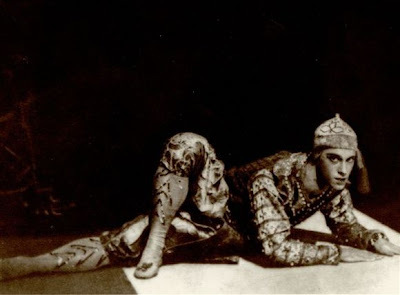 Picking up on the story yesterday, Sergei Diaghilev and Vaslav Nijinsky were a romantic couple and, as Vaslav danced and came to choreograph Sergei's Ballets Russes, together they achieved fame and success for them both. Until 1913, when Vaslav married the Hungarian Countess, Romola de Pulsky-Lubocy-Cselfalva. When Sergei found out, he was furious, and fired Vaslav from the dance company. 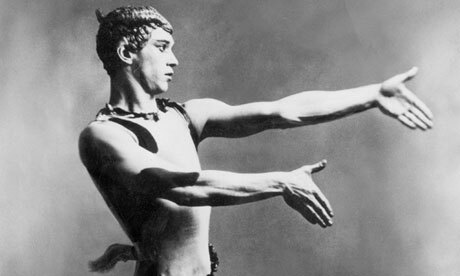 This image of Nijinsky, starring in one of the most famous ballets of the Ballets Russes, Afternoon of the Faun, is from here. Vaslav tried to form his own dance company, but it didn't work out. He spent part of World War One interned in Hungary. In 1919, after a nervous breakdown, he was diagnosed with schizophrenia and lived in various sanatoriums in Europe until he died in 1950. Sergei Diaghilev kept his Ballets Russes going and touring until his death in 1929. While it doesn't have the happiest of endings, it's fascinating to know the story of how the professional and personal relationship between these two Russian men changed dance forever. "Between them, Diaghilev and Nijinksy practically invented the modern male dancer. Before the Ballets Russes, male dancers played mostly a supporting role to the women - they were lifters rather than dancers. Diaghilev changed that, and the vehicle for that change was Nijinsky." 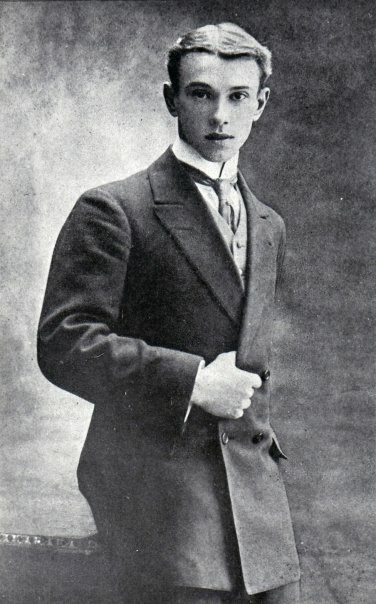 Vaslav Nijinsky as a young man, image from here. Vaslav Nijinsky's brilliance, as well as his love for both a man and a woman, are well worth celebrating! The Jean Cocteau as well as the "between them" quotes above are from pg. 181 of "The Gay 100: A Ranking of the Most Influential Gay Men and Lesbians, Past and Present" by Paul Russell.